For this last Iron Craft challenge we could do whatever we wanted. 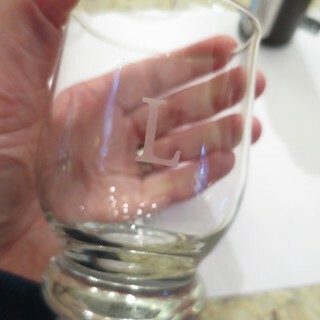 I used it as a chance to do a project I’ve been wanting to do for awhile, monogramming some glasses with etching cream. Why did I wait so long do this? Well, it’s because the glasses I wanted to monogram are actually the jars our local grocery store’s mustard comes in and I had to wait for Matt to finish up the mustard! This was such a simple project, but I love the finished look. They really don’t look like a DIY at all (or mustard jars for that matter). I have three done and am just waiting for the fourth one to be emptied. The trickiest part of this project was finding the stencils in a font I liked. The stencils I used are the Plaid/FolkArt Peel & Stick Painting Stencils. They are a bit like the Colorforms I played with as kids, though a little stickier. They say they are reusable up to 20 cleanings. I was really happy with how well they stuck, even on the third one, and the sharp edges I was able to get.Both JoAnn and Michael’s carry them, but both had different fonts and designs. 1. 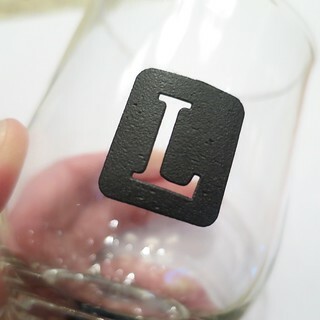 Use the ruler and marker to mark where you want the stencil on your glass. 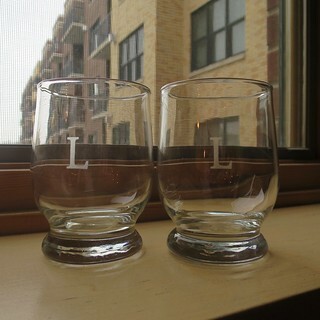 This is especially important if you are doing more than one glass and want them to look the same. 2. Place the stencil on the glass. 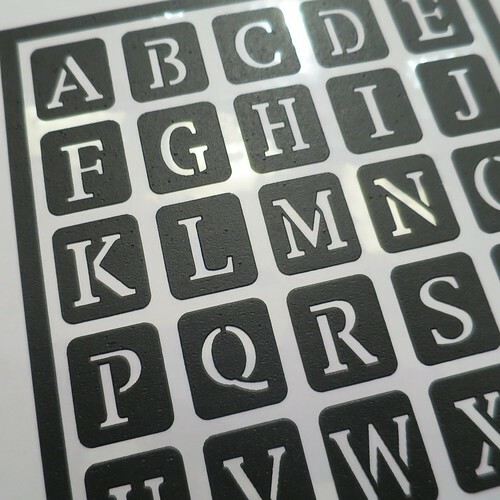 These stencils are a little stretch, so make sure to stick it on straight and not distorted. Press down all over with your finger, paying special attention to the edges of the letter. 3. Use the small paintbrush to fill the stencil with etching cream. You really want to make sure it is on thick. 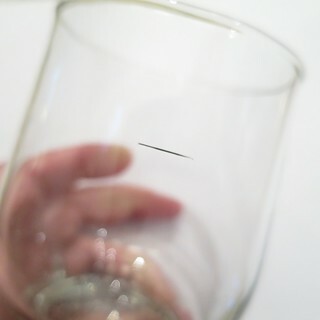 Be careful not to getting etching cream anywhere else on the glass, you can wipe it off right away if you do. 4. Let sit the amount of time your cream calls for, mine was 15 minutes. 5. Without removing the stencil, wash the bulk of the cream off the glass under warm water. 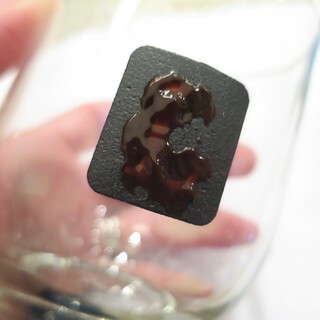 Remove the stencil and wash the glass to remove any remaining cream. Clean and dry the stencil to use again and move on to the next glass. My etching cream says the glasses will now be top rack safe in the dishwasher, though I bet the etching will last longer if they are washed by hand. I think these would be a fabulous gift. I’ll need to remember it for the future. 2 years ago by Kat in Challenges , Craft Projects , Crafts , Iron Craft , Projects | You can follow any responses to this entry through the RSS feed. You can leave a response, or trackback from your own site. The glasses look great. I have been wanting to do this for a long time. I think that it’s even cooler that you used mustard containers. Please tell what kind of mustard it is. I have never seen it in the store – or I never noticed. It is the store brand mustard at our local chain Lunds & Byerlys, so it may only be available in the Twin Cities area. I also often find great glassware at the dollar store! I have some Martha Stewart Etching Cream in my stash that I haven’t ever used. I think that I might have to revisit that oversight. More importantly, I want those stencil sets. In all of my trips to Michaels, I have never seen them. Another great project and a bittersweet finale to a great run at Iron Craft Challenges. I can’t tell you how much I have grown as a crafter/artist through these challenges and the love and support from those who have participated. Have a wonderful and amazing 2017. Some people complain online that it doesn’t work as well as other brands, but I’ve never had a problem. Just make sure to really coat the glass & let it sit. You can get all sorts of these stencils on Amazon. Michaels had them in an odd place. They were near the area with poster boards and stuff to make signs. 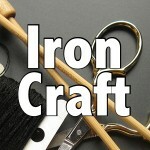 I feel the same way about Iron Craft. I have become a much better and more adventurous crafter because of it. Plus the people I have met have been amazing! I love those glasses and I’m sure whoever got them as a gift love them as well. I too, have grown so much as a crafter and adventurer since I started with this group. Thanks for everything. I think back on how much my style and tastes have changed in the last six years and that all has much to do with Iron Craft. It allowed me to explore and develop my own skills but more importantly I learned so much from everyone that participated! Thank you for leading the way. 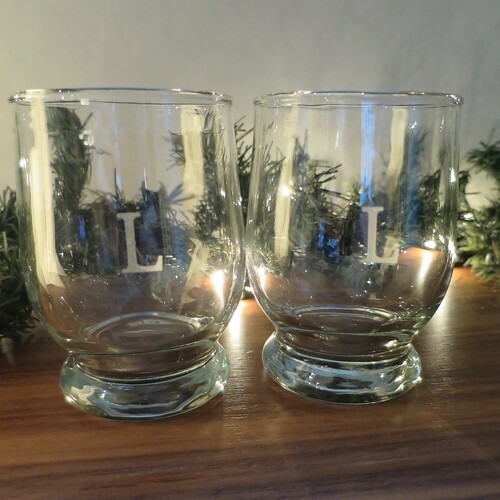 The glasses are lovely and I think I have a few of those jars sitting around! What a great project! They are so cool. I admit, I forgot that the deadline is today but I am working on my last Iron Craft project and I hope I’ll have it done in time! Phew! Finished and posted. With a little tear, I admit. I’ll miss seeing what everyone’s getting up to.